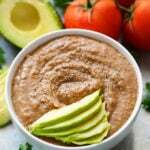 Instant Pot Refried Beans are so much better than the canned kind, and they are so easy to make! Cooked from dry pinto beans in just over an hour, and these pressure cooker refried beans have lots of flavor! Refried beans have never been my thing. I mean, if they had enough cheese on them I would eat them at the Mexican restaurant, but to me they are bland. Back in the day we would sometimes buy the canned stuff to put in a recipe, but that can of beans added absolutely NO FLAVOR to my dish! Now I make my own, and LOVE them! 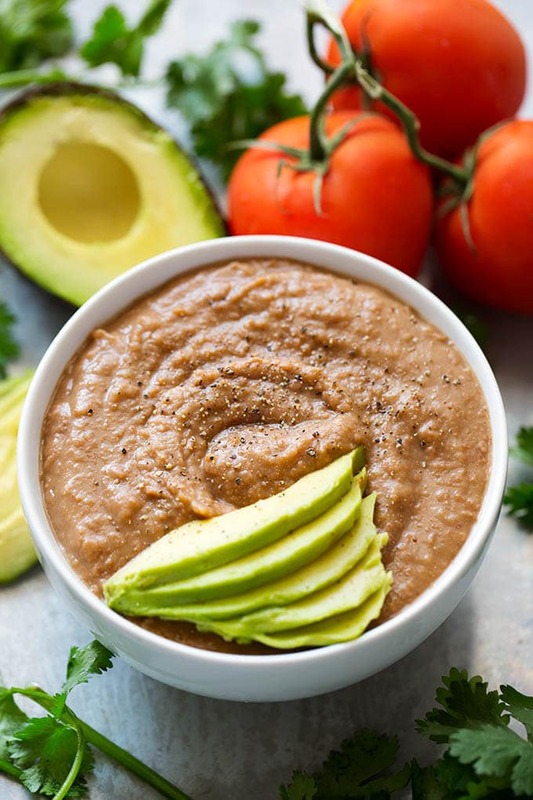 If you are making refried beans the traditional way they are more involved, but with the Instant Pot it is super easy, AND they come out with so much flavor! Dare I say Winning?! No? Yeah, that’s so five years ago! I’m nothing if not slightly behind the times. You do not have to soak the beans overnight! You can, and it will cut down the time and the amount of water you use, but I never remember to soak them. Now I don’t bother. The Instant Pot Refried Beans are done in a little over an hour. About 10-15 minutes for the pot to come to pressure. 45 minutes of cook time. 15 minutes of NPR (Natural Pressure Release). I love an Instant Pot “Dump and Start” recipe, and this one is awesome! 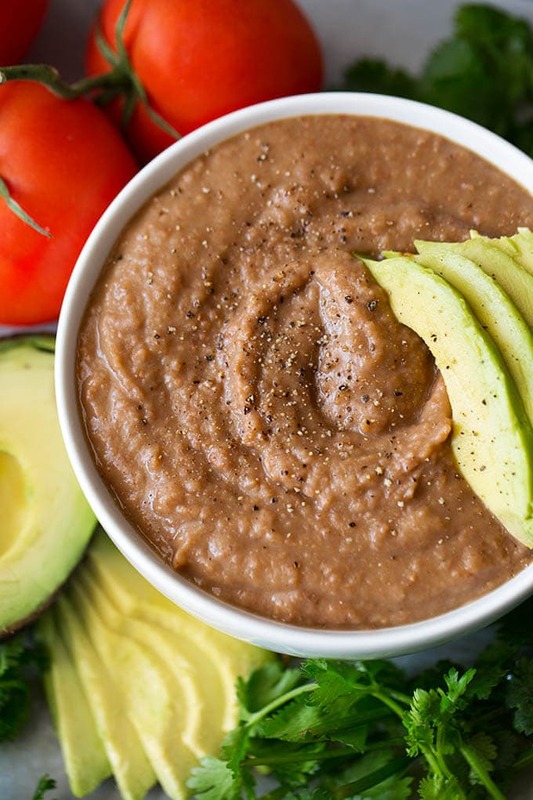 These Instant Pot Refried Beans are way better than than canned. Ready from dry beans in just over an hour! These have lots of flavor! Rinse, drain, and sort the beans. Put them in the inner liner of the Instant Pot. Add the chopped onion, fat/oil, jalapeño, garlic, spices, and bay leaves, and chipotle pepper (if using). Stir. Put the lid on the IP and set the steam release knob to the Sealing position. Press the Pressure Cook or Manual button, or dial, and then the + or - button or dial to select 45 minutes (High Pressure). The pot will take a few minutes to come to pressure. When cooking cycle ends, let the pot sit and naturally release the pressure for about 15-25 minutes, or longer if you want. Manually release the remaining pressure/steam by turning the steam release knob to Venting, and when the pin in the lid drops, carefully open the lid. Stir the beans. It will look a little thin at first, but will thicken as it cools a little. You can scoop out some of the liquid before pureeing for even thicker results. Use an immersion blender (or food processor) to blend up the beans (Careful doing this with hot beans). Or use a potato masher if you like more texture. It thickens up as it cools. I loved these refried beans! They were so good!! Hi, I’m glad you liked the recipe! We made these refried beans for Cinco de Mayo today. Everyone really liked them! We had burritos, and they were so good! Thank you for such an easy recipe. I will never buy canned refried beans again, lol! Hi Shannon, I agree about the canned! These are so much better, and easy! I’m glad you all liked them! Thank you for the nice review! 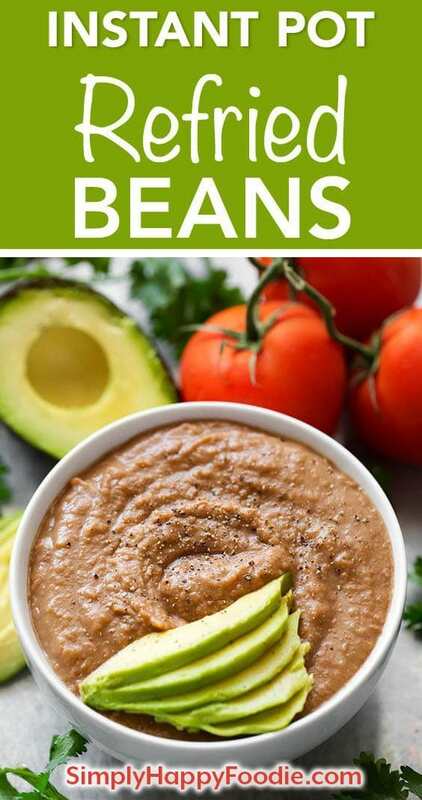 I love these refried beans! Better yet, my husband loves them! Yay! Thank you for your review! These came out so delicious! Just what I was looking for. The only change I’ll make next time is one more pepper – I like heat. But the texture and looseness was spot on! Hi! That’s great, and I’m glad this recipe worked for you! Who needs the canned beans when you have an IP?! Thank you for your review, Jaxx! I appreciate it! Made these tonight! Delish! I will never buy canned beans again! I will kick them up a notch next time-add more heat, but they were so good!!! I’m going to try and freeze some. Not sure how to do that, but I will try! Thank you, Jeri! I’m so happy you liked them! To freeze them, just put into a freezer plastic bag or a freezer container. I hope that helps. This is fascistic. So much flavor. I used the chipotle peppers. Never again from a can! Thank you! Hi Michelle, thank you! I’m glad you liked these! Yum! Everyone in the house loved it. I followed the recipe exactly, except for the Mexican oregano, since I didn’t have any I just used regular. I did not need to take away any liquid. I mashed some with the potato masher and then put some in the food processor. We are making nachos and will use these refried beans along with the taco seasoning you posted as well for the ground beef. Delish. Question for you…have you tried to freeze this? It makes a lot and I would like to save some for another time. Thanks for a great recipe! Hi Julie, I’m so happy that you liked this recipe! You can freeze it. I have and it heated up just fine. Though if you use a microwave, do so on a lower power as the beans pop and get dry spots. Maybe 50% power.